I seriously can't believe how cold it is. There is something inhumane and just downright cruel about -41C windchills in March....I seriously want to just cry instead of go outside. I could take small (but inadequate) comfort in the fact that this is record cold weather, and perhaps even go so far as to decry global warming as a sham. But since Al Gore's house is proving an inconvenient truth to him, and since global warming appears to be going full steam (or flood....or extreme weather) ahead.....I think this is just nature's way of reminding me that I live in Ottawa and that there's no way in heck winter is over yet. Meh. Few places ellicit the warmth, conviviality and pure cheap awesomeness of a vietnamese noodle soup restaurant. Pho is practically a way of life here in Ottawa, with the city literally peppered with fabulous little haunts willing to sell you joy in a bowl at a ridiculously low cost. But we're trying to eat out less. And I'm trying to cook more (hence blog a little more!). So I made pho......and it really wasn't bad, but I have another recipe that I regularly use, and I loaned out that cookbook.....and couldn't find the recipe anywhere online.....so I had to search around for other pseudo-vietnamese authenticity....I didn't really want to take two days to make broth (though I'm sure my physique could stand it, I don't think my mental health could)....so I wanted something simple/instanty, but that would still give me what I wanted. Or, more precisely, what hubs wanted. This is a fave of hubs. 1 cup (packed) spinach leaves (or bok choy) - would have added more, but hubs acted like I was trying to poison him! 1. In a large saucepan, bring broth, ginger, anise seeds, cinnamon stick, garlic and onions to a boil. Add in the fish sauce, soy sauce, and the zest and juice of one lime. 2. 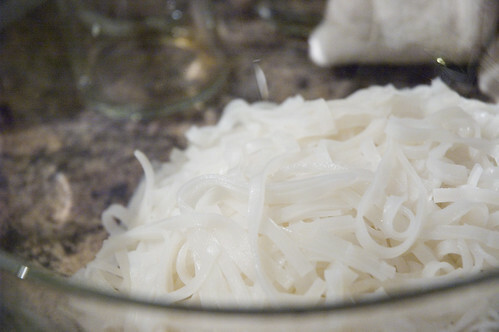 In a large bowl, pour boiling water over the noodles and let soak for about 15 minutes (until soft - noodles may take more or less time depending on the width). 3. 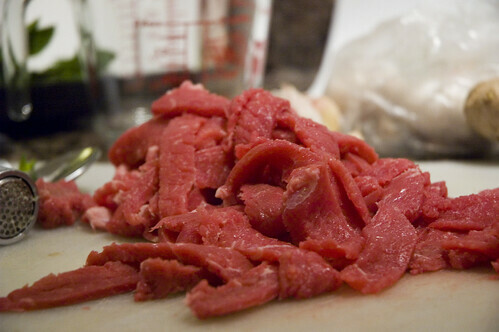 Add sirloin, sprouts, coriander, mint and spinach and cook until steak is cooked to your liking. I like to toss my noodles in to, to keep them hot. Serve super hot, and you can top with fun things like coriander/mint/basil, lime wedges, etc. A tasty meal pho sho. 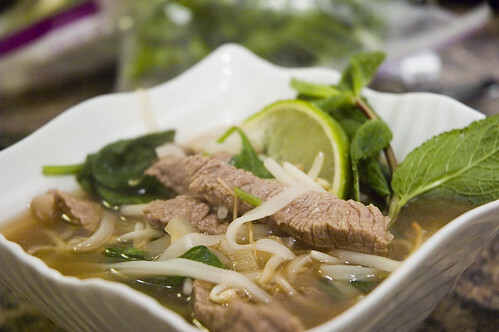 Your pho dish looks quite respectable. My cousin makes his broth from scratch (the benefits of having a Viet/Lao fiancee, but apparently it takes 6 hrs?!) and he served me pho last time I went over. yummyyyyy... But at $5/bowl (or less!) at the restaurant, I don't think I'm even going to attempt it! Kudos to you! 1/4 cup of fish sauce? ?